I have a great fondness for the Gauge. 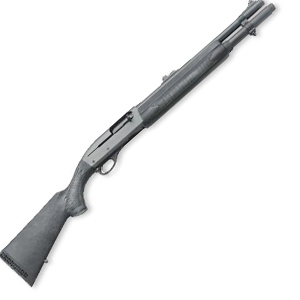 And when it comes to The Gauge, I am a firmly in the House of Remington and consider the 870 to be where it’s at. I’ve considered and examined and have fired all the Semi Autos out there. The M4 is certainly the Mercedes Benz of the class. However at it’s price… a Thousand Dollars more than most everything else, is it worth it? Man, I don’t know. It’s cool… but I am not sure its a Grand More of Cool. You know what gun I keep coming back to? The 1187. Reason? I like the position of the Bolt Release. To unleash that bolt on a Tactical Reload, it’s center bottom, easy to get to and faster than a tiny little button that everyone has positioned in the worst possible place. A small button with no geographic reference point on the gun… just alone in the field of the receiver some place where your hand can get struck by the charging handle if you don’t get it out of the way. Every semi auto in current production that feeds from a Tube does this and they are all wrong… all save for the Remington 1187. I believe this to be a key advantage. Because regardless of how many shells your tube gets stuffed with, its going to go dry and you are going to have to do a fast tactical reload. I think this is a winning position. Not only that, but the 1187 can run the same iron sights that you can on the 870, making it scary accurate with slugs. This is why my pick on the Semi-Auto Shotgun for fighting… the 1187. For impressing other guys, the M4 remains just fine. I don’t like them unless they have been converted to AK Configuration again, and even then, they need a lot of work to get them to run right. Some of them more than others. However, if your rifle is an AK, having a well set up S-12 for your shotgun has a lot going for it. Magazines are the biggest issue. None of the US made box magazines are really trustworthy (no metal reinforcement in the locking lugs like the Russians have). The Russian ones are good to go, but the 8 rounders are about $150 each if you can find them at all. Which is why all of mine are Russian 5 rounders. Saigas also tend to fail if you use box magazines and you keep them loaded long enough for the plastic in the rounds to deform. The 12 gauge round is not stick magazine friendly. I’ve actually been thinking over prototyping some box magazines for shotshells that are built to apply different pressure to the front versus the rear of the round. Basically, force it up by applying pressure to the brass head, and apply just enough pressure to the opposite end to keep it from lagging behind as the round rises. In theory, that should eliminate the deformation. Once I get a semi-auto shotgun with a box magazine, I’m going to hit the machineshop and see what I can come up with. Belts would be the best. Seems to be one of those things that varies from gun to gun. There’s a lot of variability in the shape of the bottom of the bolts and carriers. Some guys report a lot of deformation of the top round when kept loaded on a closed bolt, others haven’t really had a problem with it. A good polish job by somebody who has figured out the best shape for that area is supposed to help a lot. I personally have gotten some deformation when kept loaded for a while, but not enough to cause a failure to feed. For HD I do keep it loaded with the bolt locked open, however. Compared to the Mossberg 930-SPX? The 930 still has the same small release button that I’d rather not have. Gotcha. See, I like the Mossberg tang safety since it’s easier to manipulate with either hand with standard stock configuration. Granted, you put a pistol grip stock on there and it’s a PITA. So the bottom placement of the release button on the Rem you feel is more important/useful than the safety placement? For a Lefty, it’s easier for you to move your support hand back a little and hit the Release lever with your thumb. So my issues with the typical lay out are moot. When I shoot Lefty, I have no problem either. When I shoot Righty, then I’d rather have something more efficient. On the Benelli S-90 M1, the crossbolt safety can be reversed for lefty use. Which probably means all of the Benelli’s can be done. This may be possible on other brands. Thoughts on how it compares to the Remington Versa Max Tactical? i had an 11-87 left hand trap gun and i traded it for a colt 1917 45 acp. bad move. My understanding is that the 1187 was a blend of the 870 and the 1100. The 1100 was a bit delicate, so Rem toughened it up by incorporating the feed mech of the 870. I know people thatloved it and people who didn’t like it(samo,samo, heh, heh, heh). My old 1100 that my dad bought me when I turned 13, which makes it about 40 yrs old now, will eat anything. 00 buck to black cloud. Just keep it semi clean and greased and it goes. But then again so does my 870, even when not clean and not greased. Kind of like the difference between a 71 Mach I and a 69 Camaro. Classics. Gotta love em.